September is very much a transitional month in marketing and advertising. It seems like we’re in a limbo between the seasons when summer has essentially finished (according to the weather at least) but we haven’t quite hit Halloween and the further seasonal holidays. This means only one thing, brands pull out some of the quirkiest ads and creatives to bridge the gap from now until the dread ‘c-word’. You know when everyone says that Christmas stuff is appearing earlier and earlier every year, well the John Lewis & Partners advert feels just like that moment. Although this isn’t necessarily a Christmas advert (its the ad to launch their rebrand to ‘& Partners’), the theme is inherently Christmassy and akin to their classic annual showstoppers. The two and a half minute long advert aired at the beginning of December when Waitrose and John Lewis officially announced the complete rebrand to include ‘& Partners’. The retail chain is no stranger to imaginative, entertaining and often tearjerking commercials, and although this one probably won’t see you shed any tears, it’s definitely one of those that will make you say “oh that’s clever”. Combining one of the nations favourite tracks, Bohemian Rhapsody by rock legends Queen, with a traditional school performance, that anyone who has ever attended a British school will recognise, was sure to be a pinch-hitter with the public. Teaming nostalgic and iconic elements together was sure to bring back some memories for the majority of viewers and result in an all-around winner for the brand. IKEA has finally cottoned on to the exciting connotations linked to their iconic blue bag and their new set of ads play on this idea. Featuring the tagline “Wonders can come out of the blue” and forming the core concept of the latest instalment from the Swedish retailer where the synonymous bag is depicted as a magical device, the new adverts have truly embraced the eclectic associations of the brand. 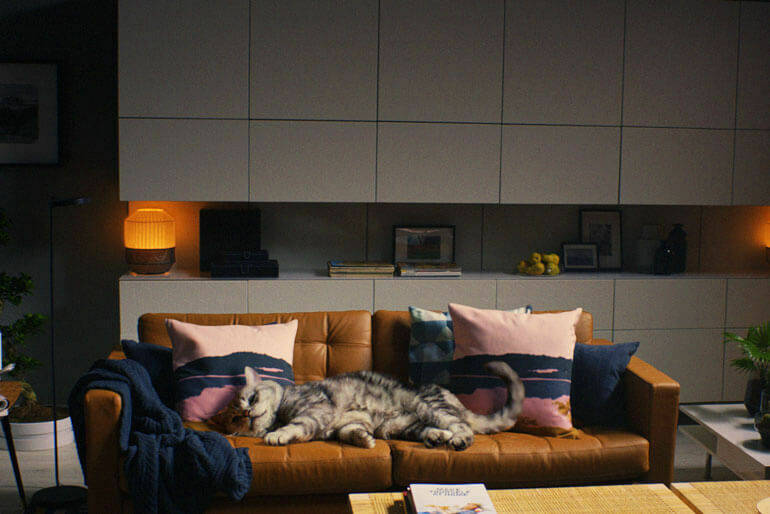 Following on from the previous trio of ladies unpacking their new teacups which turn into a giant Alice-in-Wonderland style fairground ride, this new advert sees a woman unpacking a new selection of comfortable pillows and throws which transform her into a cosy, grey cat. The overall approach for these new ads move away from the traditional room specific focus and aligns more with the marketplace section of the store. The overall messaging is that just a few new pieces can transform the complete look and feel of an area, positioning the brand as more accessible by showcasing smaller, affordable items, away from their traditional flatpack furniture. Although not inherently cutting edge, Aero launched their first TV campaign for over half a decade in the form of the ‘Bubblophone’. The contraption, which is essentially a gramophone connected to a pool of melted chocolate, was built specifically by their agency to represent how bubbles are formed in the bar. The jazz music begins to play and the pool begins to bubble and react in time with the tunes, spurting jets of chocolate into the air. The pool was custom built and tested for months, specifically to capture the perfect footage, with the agency not wishing to rely on post-production to make the idea really come to life. This challenging task included a machine comprising of ten precisely timed mechanical actions and 177 sequenced valves, to create the final result. The ad may initially appear to be a simple idea, but once the inner-workings and the amount of work that went into making sure it came together are revealed, it’s actually rather impressive. The content is so perfectly designed for the product, which needn’t be over complicated and aligns so well with the wholesome Nestlé brand. You could be forgiven for taking the new Habito campaign for something a lot more exciting than an ad for an online mortgage application. 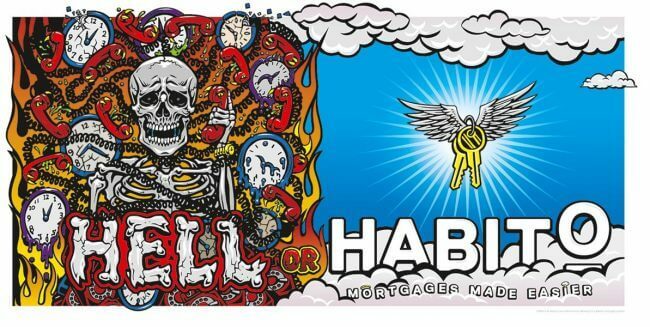 The album-cover style artwork was created to promote Habito, an online mortgage broker and portray the ‘hellish’ confusion, cost and time associated with the mortgage process. The artwork featured was created by Californian-based Jimbo Phillip who is famous for his skateboarding artwork. Phillips has worked with some of the biggest brands in the world, including Nike, Snickers, Toyota and Volcom to name just a few and continues to create ‘eye-poping’ designs which allowed Habito to bust outside of the traditional content seen within their industry. The ads tell a story of the inevitable and grim processes associated with mortgages, including a skeleton surrounded by phones and clocks and a man with his head exploding from the jargon and other complex processes. The two images are juxtaposed with a heaven of fluffy clouds, celestial rays and winged house keys to represent the ease of the service that Habito offer.